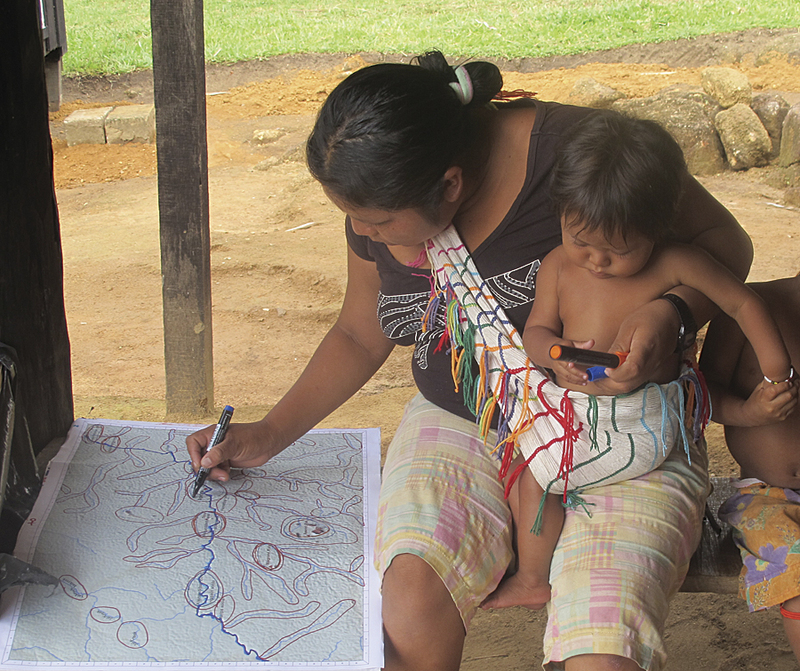 With GIS, indigenous people’s spatial knowledge is incorporated into digital maps for conservation planning. Villagers drew polygons on georeferenced landscape maps to indicate areas of local importance. With ArcGIS, a tool was developed to count overlapping polygons to identify concentrations of important places. The nation of Suriname is tucked up against the Atlantic Ocean in northeastern South America. Southern Suriname is covered with continuous tracts of unspoiled tropical forest, and it is the home of approximately 2,000 Wayana and Trio indigenous peoples. The area is currently remote, and economic development is practically nonexistent, which has helped it remain intact. However, several economic development projects for the area are becoming priorities for the national government, including mining, hydroelectric dams, and road construction. While these investments may benefit Suriname, they also pose a threat to Suriname’s ecosystems and local communities’ livelihoods, fundamentally in the lack of socioecological information. In the absence of reliable information, the decision-making process will fail to include local people’s needs in terms of land and natural resources, bringing further inequity and poverty to vulnerable people in the country. Conservation International Suriname (CI Suriname) is working with five indigenous communities in southern Suriname to produce maps depicting perceived importance for landscape services. Through this work, the organization is supporting the development of a visual tool for tribal communities to facilitate their interaction with government planners and external institutions in all issues related to their territory. To foster progress with informed decision making, CI Suriname is undertaking participatory mapping processes that produce spatial information to support a community bottom-up approach in the land-use decision-making process. To do this, the project team looked for a way to combine community mapping with GIS technology to put people’s spatial knowledge into digital maps that could be incorporated into conservation planning. 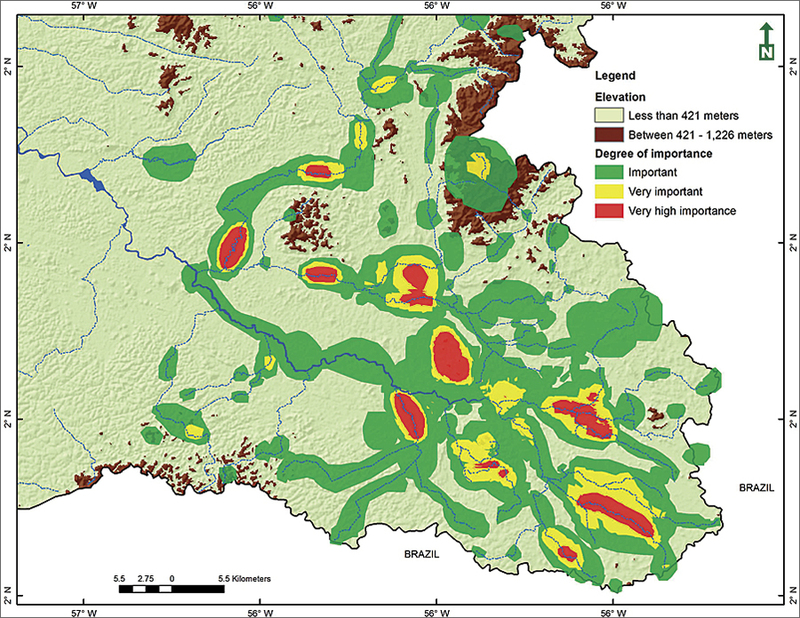 As a longtime user of Esri technology, CI Suriname chose ArcGIS to build a tool to effectively count the times that thousands of polygons were overlaid to produce maps showing the frequency of landscape services polygons as surrogates of importance; the more overlays, the more use of the area and thus the more important the landscape for the indigenous people. To produce these maps, the development of an operational tool was needed to count the number of times that the landscape services polygons were overlaid. This tool combined several ArcGIS tools to effectively map intensity of use. The input data was obtained through social mapping workshops with community participants in five Amerindian villages of South Suriname. During the data collection process, people were prompted to individually indicate, by drawing polygons on a georeferenced landscape map, the areas that they use for four distinct landscape services. The services were distinguished by using different color markers: subsistence (red), income-generation-related services (blue), culture (orange), and life-sustaining services (green). The number of maps produced during the workshops coincided with the number of participants. The polygons in each of these maps were then digitized in ArcGIS, queried by the landscape service they represent, and prepared for the data analysis process. At this stage, thousands of polygons were processed. A village woman drawing polygons on an elevation map. Using the ModelBuilder environment in ArcGIS, a tool was developed to count overlapping polygons inside a shapefile, and a new shapefile was created with polygons whose attributes are the number of overlaps identified in that specific spatial unit. The developed tool has a simple user interface: it first asks for an input shapefile, which has all the polygons mapped in the area, and then it asks the name and location of the output shapefile. CI Suriname uses this tool to identify concentrations of important places for provision of landscape services according to the perceptions of local people. ModelBuilder flexibility lets CI Suriname integrate available tools to create a new user-designed tool able to process a large amount of information and with a user-friendly interface. Identification of the areas important to local people is useful input to develop sustainable action plans and support decision making. Indigenous communities see the importance of the maps to facilitate dialog with outsiders. Some of the villagers highlighted the importance of the maps for tourism, while others highlighted their importance for future generations. Sara O. I. Ramirez-Gomez is South Suriname project coordinator for Conservation International Suriname. Christian Martínez is the land-use planning coordinator for Conservation International Ecuador. For more information, contact Sara O. I. Ramirez-Gomez or Christian Martínez.